The U.S. Embassy in Santo Domingo announces its FREE “Concert for the Americas” to celebrate the 4th of July, United States Independence Day, here in Dominican Republic. The renowned The Harlem Gospel Choir from the United States The HARLEM GOSPEL CHOIR, will be here for the first time in DR. This is one of the most prominent gospel choirs in USA touring the world. They are based in Harlem, New York. The group consists of 40 singers and musicians plus some special invited guests plus two musicians playing keyboards and drums. There will be 2 spectacular performances. On Tuesday July 2, 2013 in Santiago at the Gran Teatro del Cibao starting at 8:30PM. On Wednesday July 3, 2013 in Santo Domingo at the Teatro Nacional Eduardo Brito, 8:30 pm. Tickets are free and can be picked up in advance at the theaters box offices Box office hours. 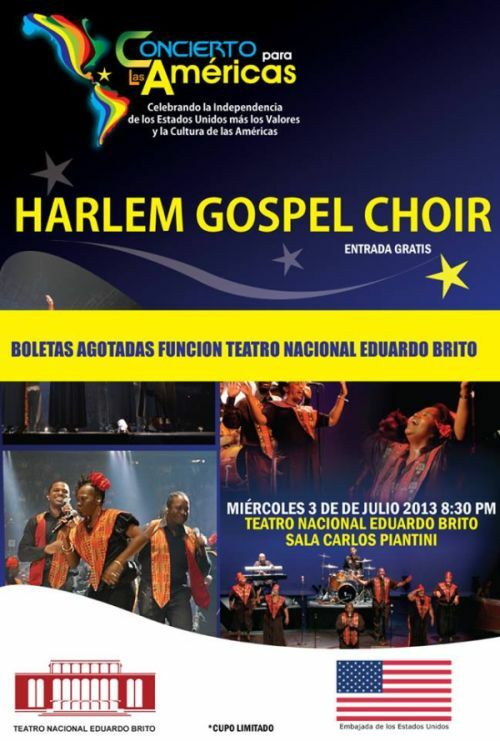 Events harlem gospel choir, santiago, teatro nacional, us embassy. permalink.